Thanks to Roger Pettersson for taking the time to complete the feature and to Roger Lyrén for additional information. Roger: I'm 36 years old and married to Lina. We have 5 children; Lucas, Linea, Amanda, Alma and Alice. We live in Stockholm and I work at Skanska IT-Solutions where I am responsible for "alarm and passage". Roger: My first contact with drag racing came in 1984. A club championship at Mantorp for the Huddinge MCK. Roger: The first time I took part in an organised drag racing competition was 1987, with a 1260 cc Suzuki Katana '83 and I won!!! That’s where it all began. Eurodragster: What is your current bike? Roger: '02 Suzuki GSXR 1000 with a Track dynamics ultra light 2002 chassis. Eurodragster: When did you acquire your current bike? 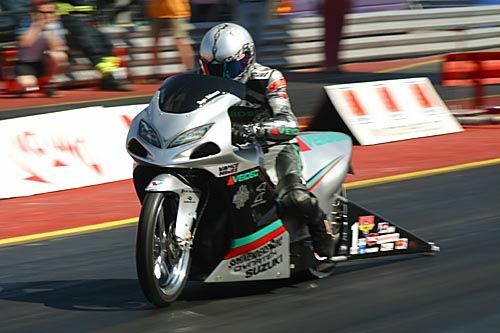 Eurodragster: Who built the bike originally? Roger: We bought a rolling chassis from Track Dynamics, which arrived on Midsummer Day. I prepared it with assistance from Jörgen Byström. Roger: The engine is a Suzuki GSX 1500cc, with Vance and Hines two-valve aftermarket top end. It is build by Byron Hines and modified by Roger Lyrén. Eurodragster: What drivetrain does the bike employ? Roger: Rk 530 chain, gear ratio 17/47. Eurodragster: What is the bike's race weight? Eurodragster: How the bike has developed since you first got it? Lars-Olov Ericsson - Bus driver and helps out with everything else! All our kids, they are all ready to help out whenever a job needs doing. For 2003 the team will be expanding and will include Öyvind Von Essen and his crew. Roger: To recapture the UEM title and be the first one to run 300 kph (186.46 mph) on a Pro Stock Bike outside the United States. We also want to run 2 NHRA races (Las Vegas and Pomona) and qualify there. 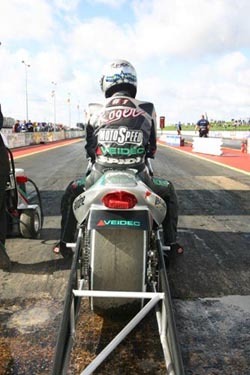 Eurodragster: What is your favourite story/moment involving the bike? Roger: The victory at Mantorp in 2002, it was my first victory on this bike. Roger: 1996. My first victory against Veli Malin, he was an extremely target-oriented. Roger: The acceleration and the intensity in the sport itself, everything about being a part of a race, the social contacts, the response. Roger: The Crew manager Roger Lyrén, for being able to put up with me all these years and for his enormous experience. Roger: My family, who have supported me during my competitions. Veidec. All the team-members. Jörgen Byström at Super twin and Thomas Klarkner at Motospeed and all other sponsors who have supported me during the 2002 season. A special mention must go to Veidec's Rickard Pålsson who is a great help to our team and also to all the team members wives that have supported us all these years.